PediWrap™ Pediatric Arm Immobilizers are cute, comfortable arm immobilizers that quickly and safely control arm movements to prevent kids from pulling out feeding tubes or tracheostomies, putting objects in their mouths, or inflicting injuries to themselves. They are very effective bandage covers and are highly recommended for splinting arms to maintain muscle length and joint range of motion. They are also very effective in upper extremity stabilization to promote weight bearing in 4-point (quadruped). These immobilizers are fast and easy to use. Simply wrap the arm and secure with Velcro® closure -- the Velcro width allows for adjustment around the arm. There are four styles of immobilizers to choose from, all are sold as pairs. Please specify whether for boy or girl when ordering. The standard, Wrist Length Immobilizer without Thumbhole comes with 2" Velcro® overlap, a removable shoulder strap, and allows use of the hands. 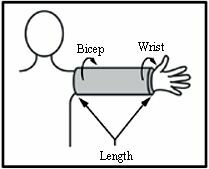 The Plus Size Wrist Length Immobilizer (P model) is 2" wider and has 4" of Velcro® overlap to fit over clothing or for larger kids. It also features a removable shoulder strap and allows the child to use his hands. The Wrist Length Immobilizer with Thumbhole (T model) restricts hand movement and comes with a removable shoulder strap (Newborn size does not come with a shoulder strap). The Plus Size Immobilizer with Velcro® Wrist Closure (V model), to keep it in place, does not have a shoulder strap. Shoulder straps are NOT recommended when the child sleeps. Holding the arm straight out, measure the arm from the underarm to the wrist. This is the length you need.